When walking around any bustling city, we notice the tall, concrete and glass buildings, but usually don’t get the opportunity to experience how companies inside those buildings create an invigorating space for their team. 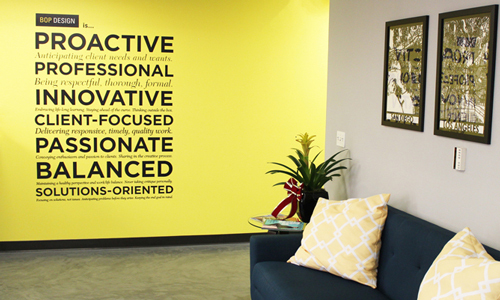 Bop Design is a perfect example of a company that has cultivated a bright and happy workspace. The marketing and web design agency offers services to help companies establish brand identity, create an engaging website design and utilize content marketing to drive inbound marketing leads.